This recipe is a variation on one of the most classic cookies, the legendary Oatmeal Raisin Cookie. The oats always make me believe I’m eating something more wholesome and it’s still a treat! 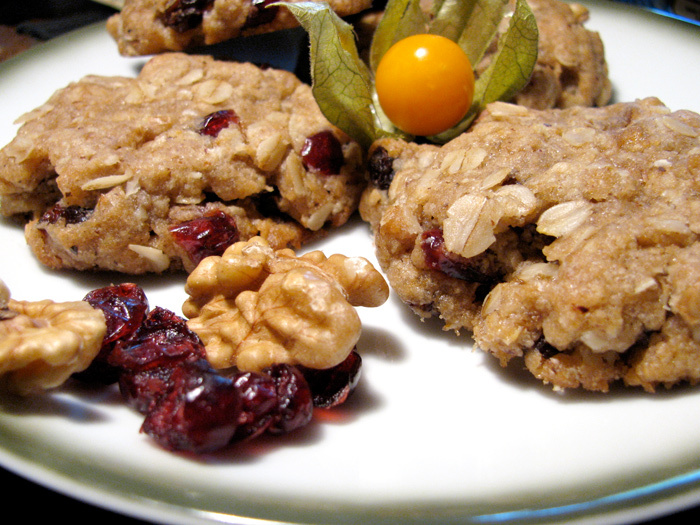 The cranberries lend a fruity tartness and the mix of walnuts and ground hazelnut amplify the nut taste. You could replace the cranberries with more raisins, or the raisins with more cranberries, or both with more nuts, as you like. Add some ground flax or hemp seeds if you’re feeling extra earth-crunchy. Unlike most baking recipes, this one is fairly hard to mess up. Hmm… Maybe that’s why I like it so much.